We believe that all people in Cuyahoga County have the right to live their healthiest lives, no matter where they live or work, how much money they make, or what their race, religion, sexual orientation, or political beliefs. As a partnership, HIP–Cuyahoga believes that for our community to make progress, we must transform our approach to health. As a partnership, we believe that the conditions in which many people in our community live are often unsafe, unhealthy, and unacceptable. This did not happen by accident, but is the result of many years of public policy and private actions that created opportunity for some, while oppressing others. The worst health outcomes are in the urban core—Cleveland and its inner-ring suburbs, such as East Cleveland, Cleveland Heights, and Maple Heights. According to the 2015 County Health Rankings*, Cuyahoga County ranks in the bottom third of all 88 counties in Ohio for residents’ health outcomes. Even though Cuyahoga County ranks consistently in the top 10 in the state for clinical care (measured by access to and quality of care), this has not made our residents healthier. That’s because the conditions that shape health are not spread equitably across the county. And, in turn, that causes significant differences in life expectancy, depending on where someone lives. The worst health outcomes are in the urban core—Cleveland and its inner-ring suburbs, such as East Cleveland, Cleveland Heights, and Maple Heights. This is where many people of color live, including African Americans, Asians, Pacific Islanders and Hispanics. High poverty, unsafe streets, a lack of grocery stores and other community conditions cause barriers to health for most residents. 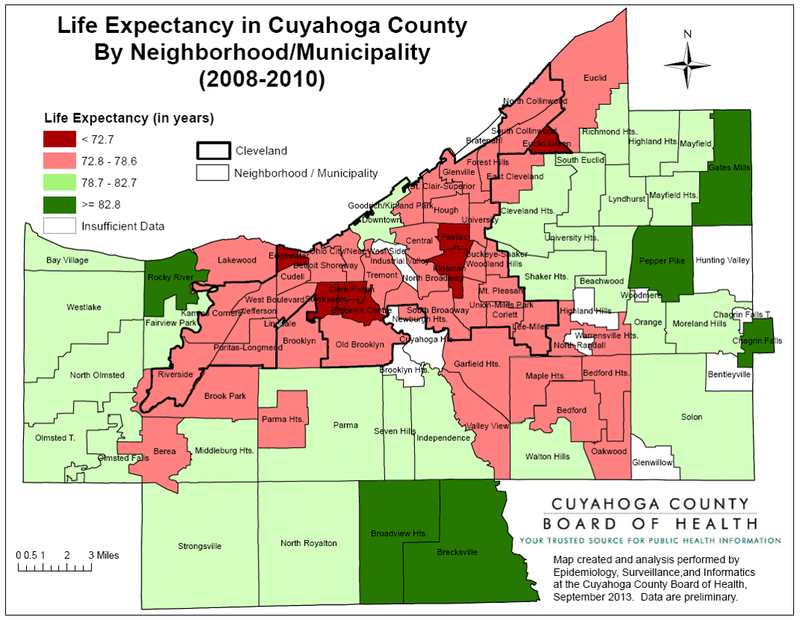 With limited opportunities to be healthy, many people in Cuyahoga County are living sicker and shorter lives. This is not about differences in genetics or health care access alone. It is unfair and unjust. There are significant differences in life expectancy, depending on where someone lives. View Life Expectancy Map. Three times as many African-American babies die compared to white babies. Our community experiences two to three times as many poor mental health days as the nation. The cancer death rate is 1.5 times higher in the City of Cleveland as the national benchmark. Two to three times more African-American and Hispanic residents experience poverty as whites in the City of Cleveland. New! In November, 2018 HIP-Cuyahoga and partners released the first ever (in Cuyahoga County) combined community health assessment. Click here to visit the 2018 Community Health Assessment page.